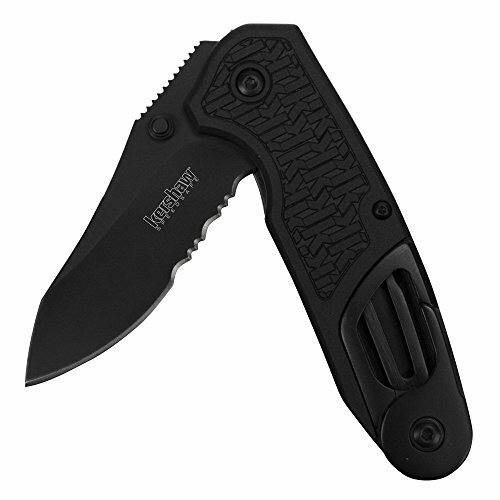 Kershaw’s Funxion EMT is emergency-ready, with numerous tools for any situation. The knife’s 3-inch blade is made of 8Cr13MoV stainless steel, offering excellent wear resistance and edge retention. The large drop-point blade is ideal for taking on both everyday cutting tasks and heavy-duty projects. Equipped with SpeedSafe, the Funxion EMT is easily opened with one hand by pulling back on the built-in flipper. The included tool kit contains a cord cutter, hex bolt wrench, flathead screwdriver tip and carbide glass breaker tip. Separate liner locks for the blade and tools ensure safety while the knife’s partially serrated blade enables it to rip through tougher materials. The glass-filled nylon handle is lightweight and sturdy, featuring non-slip K-Texture for secure grip. A deep-carry pocket clip and carabiner enable the knife to be carried anywhere. Choose a reliable companion that anticipates every need during demanding situations. Choose Kershaw’s Funxion EMT with included toolset.